By Sheil Kapadia·	 10/24/2012, 9:44 a.m.
One reason why Andy Reid is sticking with Michael Vick is because the quarterback has actually shown real improvement in a couple key areas. 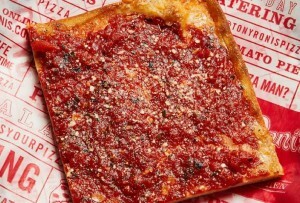 Most notably, against the blitz. In the first three games, teams killed the Eagles with extra pressure. 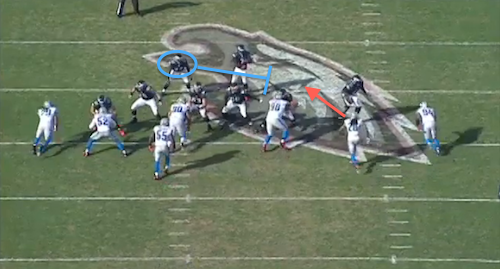 The offense had breakdowns in protection, Vick held on to the ball, receivers ran routes way downfield. Overall, it was a disaster. But in the last three games (while the offense has still had plenty of issues), the Eagles have done damage against the blitz. Just look at the numbers. Vick is 29-for-42 for 405 yards, four touchdowns and no interceptions against extra pressure. That’s a 69 percent completion percentage and 9.6 yards-per-attempt. If you’re a glass-half-full kind of fan (c’mon, there has to be one or two of you out there), this is something to be optimistic about looking ahead to the final 10 games. 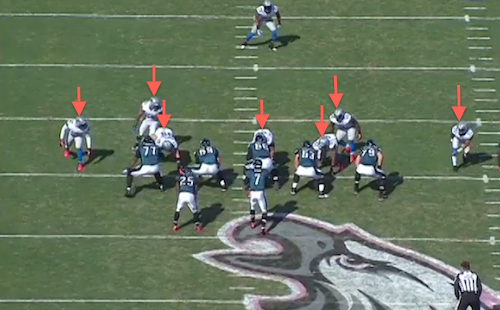 Since the Eagles were on bye last week, there’s no new All-22 to break down. So instead, let’s take a look at some of the ways the offense has beaten the blitz in the last few weeks. Play 1: Here, the Lions show blitz at the line of scrimmage. It’s 3rd-and-6, and they’re going to bring seven rushers, including the slot corner. The Eagles are in a 1-RB, 4-WR set with no tight ends on the field. That means they lose the numbers game up front. It’s six blockers against seven defenders. 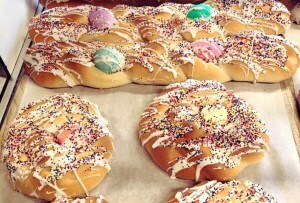 Someone is going to be unaccounted for. But everyone executes their one-on-one blocks. Here you see the linebacker rush unblocked between Danny Watkins and Todd Herremans. But again, that’s nobody’s fault. It’s on Vick here to get rid of the ball quickly. The routes are key too. You’ll notice three of the four receivers are running short or intermediate routes. Vick actually has multiple options. 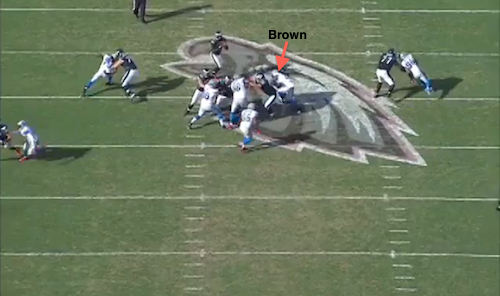 The key is getting rid of the ball before the unblocked rusher gets home. Vick does that, stands in the pocket, fires a strike to Riley Cooper for 8 yards and takes a hit, allowing the Eagles to extend their drive. Play 2: Those 8-yard gains are nice. But good offenses burn teams with big plays when they blitz. 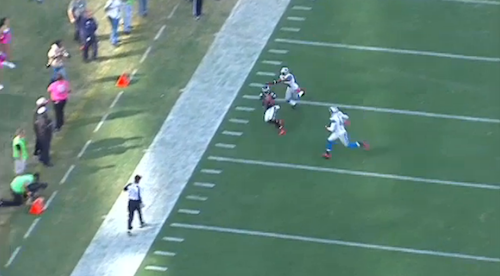 Here, the Lions send safety Louis Delmas. The key to blocking him is going to be running back Bryce Brown, who has to first recognize the blitz and then get to Delmas across the formation. Brown does a really good job here. 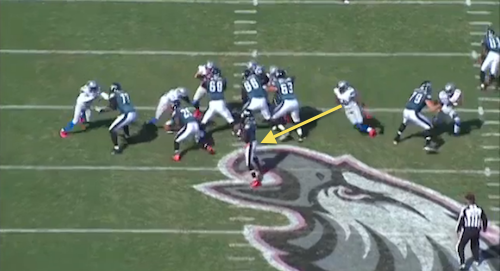 And Vick does a good job too, taking a couple steps to his right to create space in the pocket. The other key is the throw. As we showed last week, there are times when Vick is making good reads and good decisions. He’s just misfiring. Here, he throws a beauty. 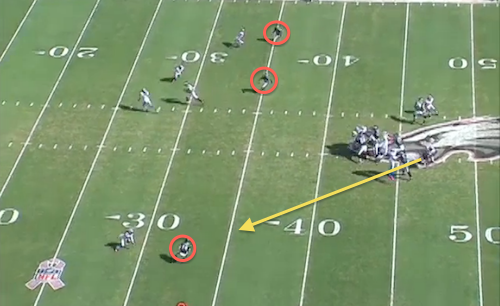 Check out what the coverage looks like when Vick gets rid of the ball. The pass has to hit Jackson in stride, but also has to angle towards the sideline so that the safety can’t get there in time. Here, you can see the window Vick is working with. The result is a 30-yard completion and one of his best throws of the day. Play 3: Big plays don’t always have to mean deep throws downfield. The key to the next play starts before the ball is even snapped. 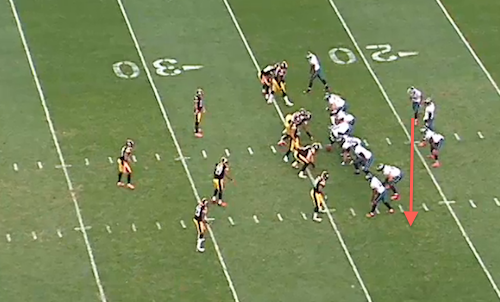 Jackson starts in the backfield to Vick’s right, but then motions out to the left. 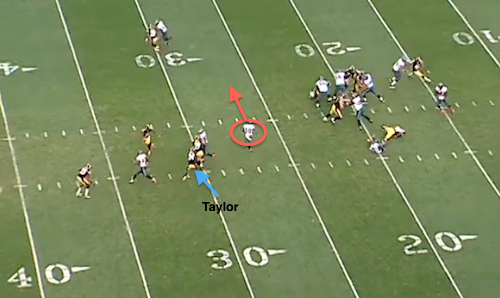 Cornerback Ike Taylor goes with Jackson, signaling man coverage. The Eagles set up a bunch look. They’ve had some success in the past few weeks hitting on big plays out of the bunch (like Jeremy Maclin’s 70-yard touchdown last week). 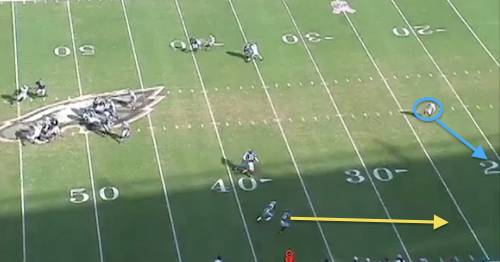 Jackson is the outside receiver, but he runs a drag route across the middle of the field. 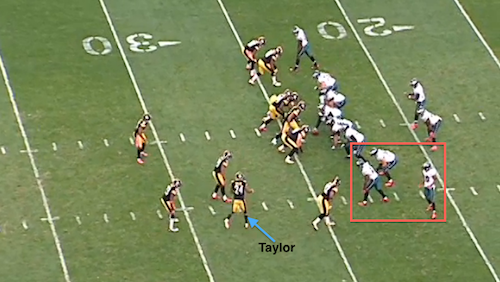 Taylor is in man coverage, but Jackson runs behind Brent Celek, who picks the cornerback. Jackson is wide open over the middle. It’s only a 6-yard completion, but he picks up 19 yards after the catch for a big play. 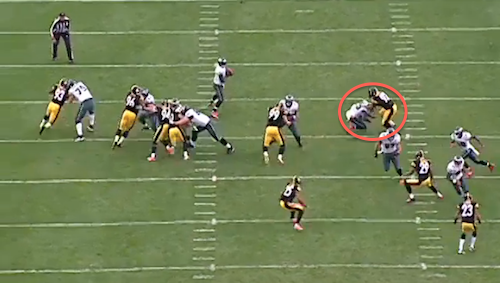 Of course, since the Steelers were rushing six at Vick, protection too was key. As you can see below, the offensive line did an outstanding job. And most importantly, LeSean McCoy, who was charged with blocking James Harrison, takes his man to the ground, giving Vick plenty of time to find Jackson.